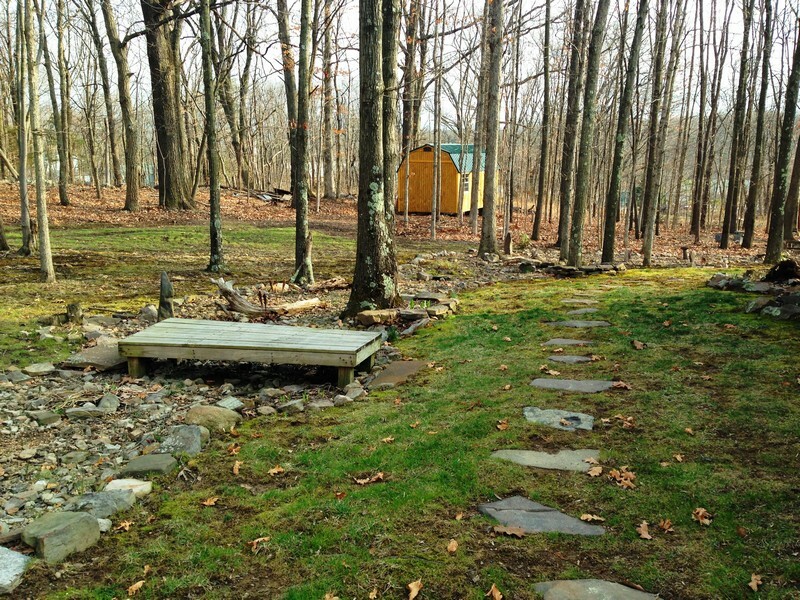 With 2 1/2 private acres of heavily forested land in Capon Bridge, WV, Vince has both a forested gazebo and cabin in the woods for outdoor options. During colder weather, his oversized wood-stove keeps the lower level of his home very pleasantly warm for your massage experience. With 2 1/2 acres of heavily forested land in Capon Bridge, WV, the outdoor sights, sounds and smells provide a massage experience that most have had. At times, sunlight finds it's way onto the body, cool summer breezes, warm humid air, lightning bug shows at dusk, bird songs, occasional rain storms, and the rich smell of the forest all engage the senses during an outdoor massage. 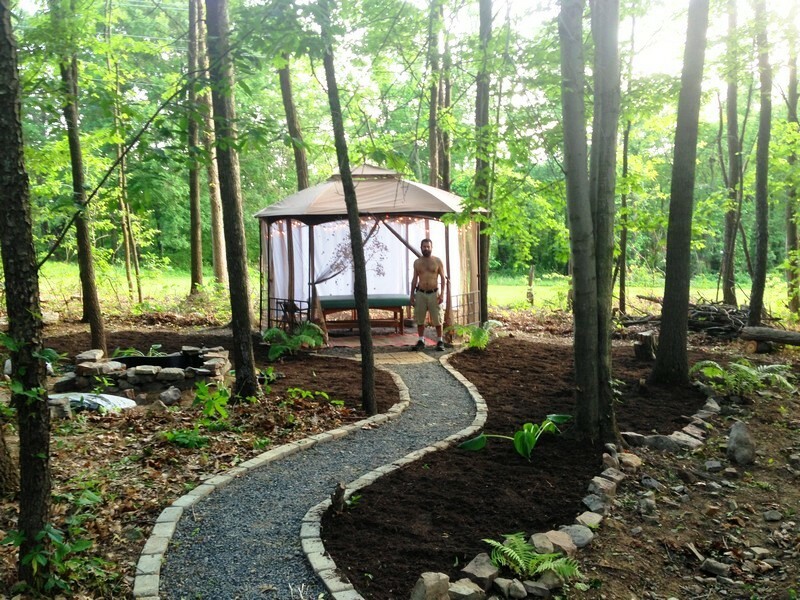 Forested Gazebo: The gazebo includes a canopy cover and open sides (private) as well as a small 125 gallon pond and foot high water fall constructed and lined with local stones creating a wonderful water sound as part of the massage experience. The gazebo itself is an octagonal structure with screen meshing around but otherwise quite open to sunlight and forest views. The outdoor massage table is well cushioned and warm sheets are used depending on weather to no sheets at all -- at the client's discretion. 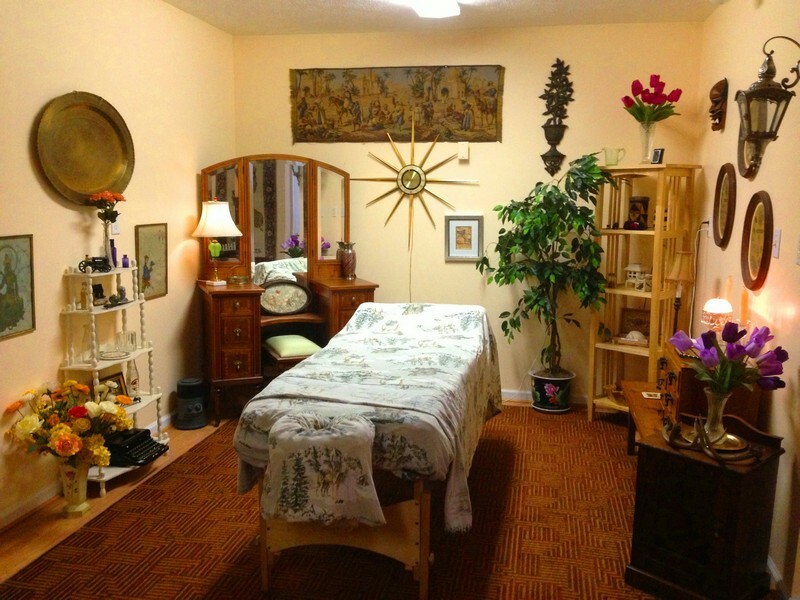 An ideal place to lie and rest for a while after your massage experience has completed. Cabin in the Woods: This new 10'x20' camping cabin is ideal for a bit more private forested massage experience. With it's large barn doors able to be kept open wide, and 3 windows for cross ventilation, this elevated building is ideal for those liking a bit more privacy or who have aversions to critters and other outdoor "visitors". This beautifully decorated interior (photos coming soon) can be opened up for fresh air, breezes, and even sunlight to enter the wide barn doors. The massage table in the cabin is well cushioned and warm sheets are used depending on weather to no sheets at all -- at the client's discretion. An ideal place to lie and rest for a while after your massage experience has completed. The Indoor Home Studio: The indoor home studio massage experience in the lower level of my home still has a way to stimulate the senses with the beautiful setting in a room filled with antiques, flowers, and world decor, a very comfortable padded and heated table, wonderful music, and a piping hot wood stove fire keeping the room typically in the 80+ degree range during the whole massage experience. Sometimes even the summer weather isn't so conducive to outdoor massage, and when temperatures are too hot or humid, many folks still opt for the then air-conditioned indoor setting.